Winner winner, chicken dinner! I grew up Jewish, and Friday nights at our house were pretty sacred. No parties or outings for us at the end of the week, no siree. Instead, we had the traditional Shabbat dinner at home, complete with yummy challah bread, icky Manischewitz wine, and chicken. Always chicken. Meanwhile, my mother Phyllis was a “Three Ingredient Cookbook” kind of cook – the easier the better. 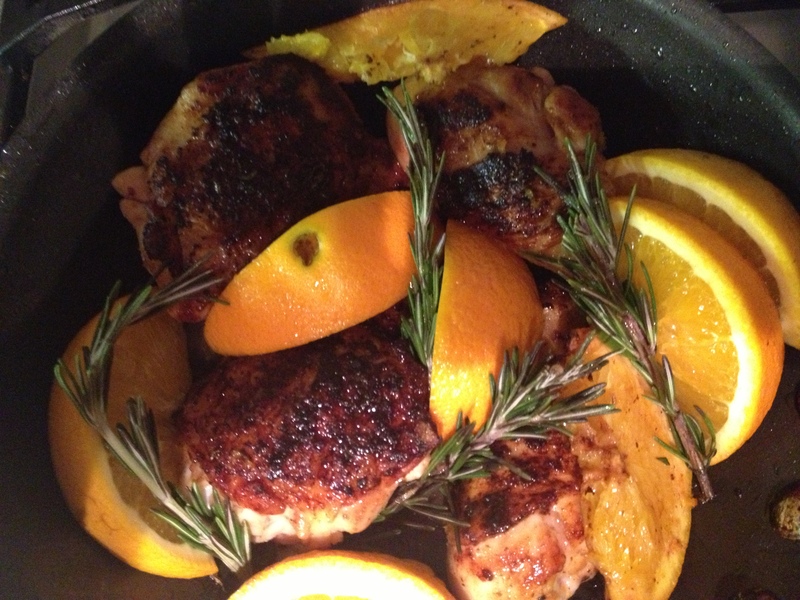 And my favorite Friday night dinner, by far, was her super-simple Orange Juice chicken. It’s sweet and tart at the same time, with just a hint of a kick, and couldn’t be easier to make. And the best part? The tangy orange sauce that we used to spoon over white rice. I’m serious when I say that for all my high falutin’ foodie airs, if I had to choose a “last meal,” this would be it! BUT, since I am a foodie, I wanted to see if I could come up with a new, revised version, using real oranges instead of the canned stuff – go figure! 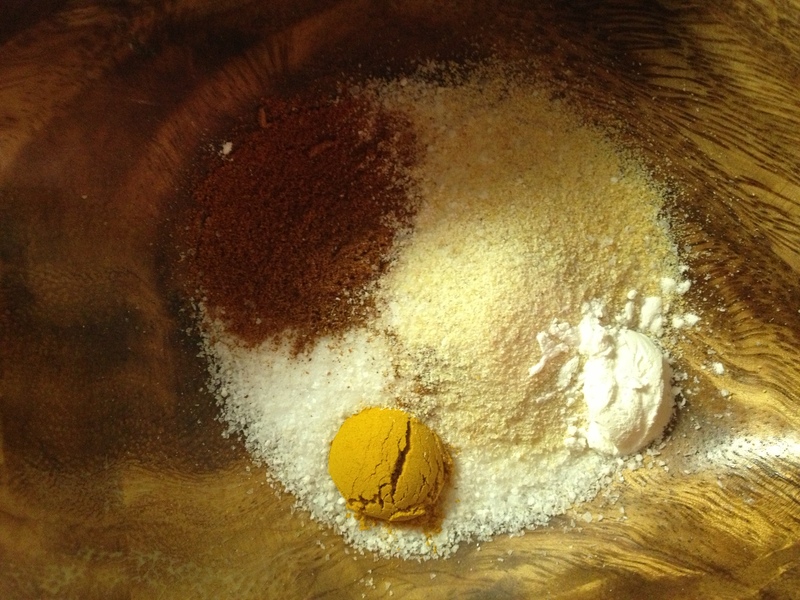 – and making my own “Lawry’s” seasoned salt. The first is decidedly simpler, but the latter packs a great punch, if I do say so myself! See which one you like better! *Optional – my mother never did this, but when I make this dish now, I add some orange and onion slices to the roasting dish halfway through the cooking time. It gives a little oomph of flavor, plus it’s nice for presentation. Clean chicken pieces and trim off any fat or extra skin. Season generously with the Lawry’s salt and a little pepper and place in a large roasting pan. In a medium mixing bowl, mix the can of orange juice concentrate with 1 can of cold water and stir. Pour the juice mixture over the chicken and cook for 45 minutes to an hour, or when the meat is tender and no longer pink. If adding the onion and/or orange slices, put them in the roasting dish after about 20-25 minutes and continue cooking. And that’s it! Clean and trim chicken pieces and season generously with the homemade seasoned salt. Heat olive oil in large ovenproof skillet over medium heat and place chicken in skillet, skin side down. Sear about 7 minutes, until the skin is a nice golden brown. Transfer chicken to a plate and pour off fat from the skillet. Return chicken, skin side up, and add rosemary and shallots. 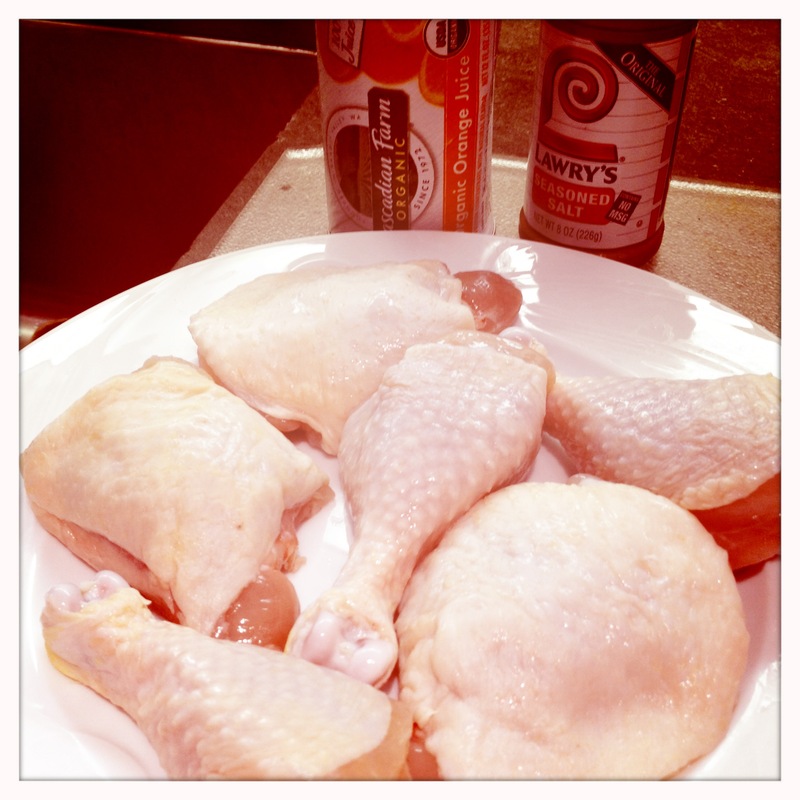 Slice 1 ½ oranges into wedges and put in pan, squeezing a little juice over the chicken when you do this. Transfer to oven, and bake until cooked through, about 25 minutes. When chicken is done, take the skillet out of the oven (don’t forget to use a towel or oven mitt!) and place on stovetop. Using tongs, remove chicken to a plate, along with the shallots and oranges. Discard the rosemary, leaving just the sauce. Squeeze the juice of the rest of the oranges into the sauce and heat over medium heat. Add vinegar and stir, then reduce by half, about 3 minutes. Take pan off heat and add butter, stir, then put the chicken, orange wedges and shallots back into the pan and coat. Serve warm, especially over rice!